Selva Chi (Chi Forest) is an arboretum of almost 40 hectares in Tongorachí, in the South of Esmeraldas province on the North coast of Ecuador. Since 2006, it has been the labour-of-love of Selffinity’s original founder, Martin Couell. Selva Chi is a uniquely human-interactive botanical conservational project. The concept arose from the present desperate situation of the world’s and especially Western Ecuador’s wildlife slipping into extinction at a horrifying rate. We keep being reminded that it is almost exclusively due to habitat lost. So the great creators of habitat for most terrestrial life, trees, are by far the most important to protect. This was the same response Martin had when he commenced a smaller project of 128 native species of rainforest trees in Australia from 1979 to 1991. 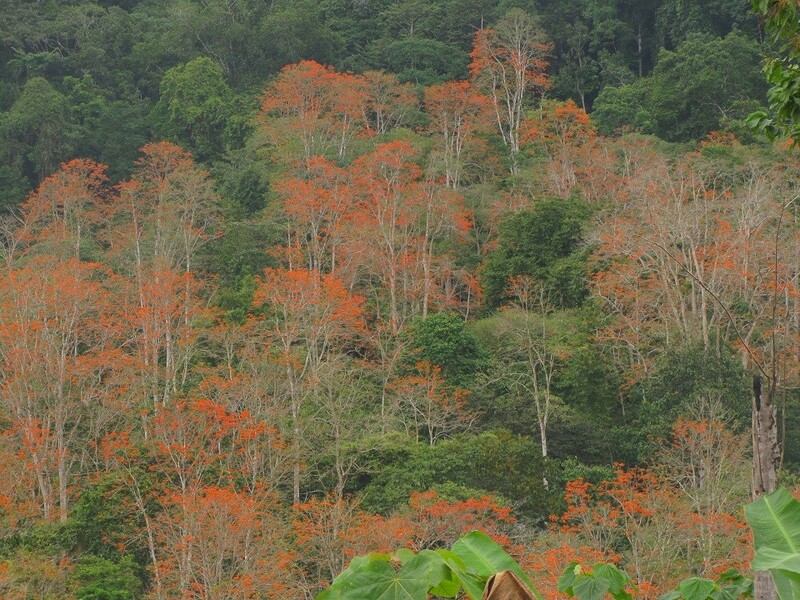 The Native Arboretum in the dry season with 25-35m tall Mamblas, Erythrina poeppigiana, in flower. Some decades ago the best solution was considered to create protected areas such as national parks and reserves. While this is part of the solution, alone it has not changed the game, only the rules. Now habitat depletion continues as ever but Ministry of Environment officials collect bribes for permitting its continuation. The reason for choosing such a solution is likely to be because those who did the related studies and proposed the solutions were almost inclusively ecologists assuming the problem were an ecological one. So at best, studies may have identified humans as the cause of habitat destruction but did not want to contemplate solutions beyond their field. As a result they attended a symptom of the problem instead of its cause. Selva Chi is an attempt to truly tackle the source of this problem, not by separating humans from the wildlife to be protected, but by bonding them to it. Humans must be reintegrated into the ecosystem, and this starts by taking into account our far more complex psychological nature than other species. Bonding with nature doesn’t last long if it is an isolated “romance”. It must be accompanied by ways we can adjust our every-day lives for the sustainable better. A typical city landscape is a monoculture of humans nourished by a mono-currency. They are products of our monoculture mindsets. Selva Chi connects humans to plants through everything they see, smell, hold, weave with, build with, climb, roll in, swing from, collect and eat from, are healed with, have fun with and learn from. All these subtle but profound activities lead people to plant a garden in their minds, that will spread its seeds wherever they dwell. The food-forest contains over 100 fruits, nuts and spices (6 hectares); as we approach times when we will be paying for fresh air, the designer of Selva Chi believes a health society is one where this, drinking water, raw local food and even basic building materials should not come from an economic system but from the ecosystem. These are the sacred gifts that create peaceful, low stress communities. When personal interests can manipulate our access to these we are planting seeds of violence within ourselves, amongst ourselves and against nature. The food forest is a model example of how a variety of raw food for whole communities can be virtually free, apart from the effort of planting and harvesting. Apart from being low maintenance it does not focus on products that are most commercial but that are most needed and most useful locally. This area will provide an opportunity to merge the definitions of work and play when participants learn to climb trees safely while discovering new flavours and working in teams to harvest the ingredients for preparing the next meal. 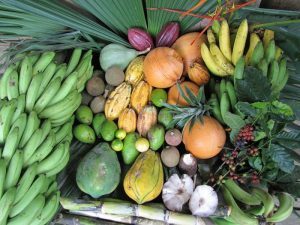 This area has many of the common local crops such as bananas, cacao (Chocolate), avocados citrus and coconuts but soon there will also be less familiar products such as champadek, jaboticabas, mangosteens, durians, nutmeg, salaks and pilinuts. The materials forest is about 15 hectares of mostly timbers (and of those, mostly natives), canes, thatches and twines, but products such as rattans, fibres, coloured seeds, gums, dies and medicines are growing. This area provides products that are needed less frequently than food. It will be visited by students to collect primary materials for arts, crafts and construction. Giant bamboo can be used for making furniture, tree houses, bridges, bee-hives, lanterns and rafts; mocora and raphia palm leaves as well as rampira leaves can be used for making hats, mats and book marks; seeds of alchochillo, caracas and others combined with shells found on the beach make beautiful knecklaces, earrings and place mats. The native vegetable ivory, locally called Tagua, can be collected and elaborated into countless beautiful and strong objects. Baskets can be made from piquigua twine, rampira or abaca fibre, native or exotic rattan. Articles may be coloured with several local dyes and sealed with latex, gum or bee wax. This section still needs more planting and, with time, may also inspire new markets or a small rural industry. The theme of Selva Chi concentrates on the rich palm diversity of Western Ecuador, but in order to understand this it is important to have an appreciation for the great diversity, usefulness and beauty of the family as a whole. This is particularly useful for inspiring Ecuadorians into valuing plants in general and tropical gardening more specifically. When most Ecuadorians think of gardening they think of roses and other European flowers. Of the 29 tribes of palms the garden exhibits examples of 24. Perhaps the most significant of these is the Nypah palm. These needed their own pond made, as these are the only mangrove palms. Fortunately they are just as happy in fresh water as brackish. 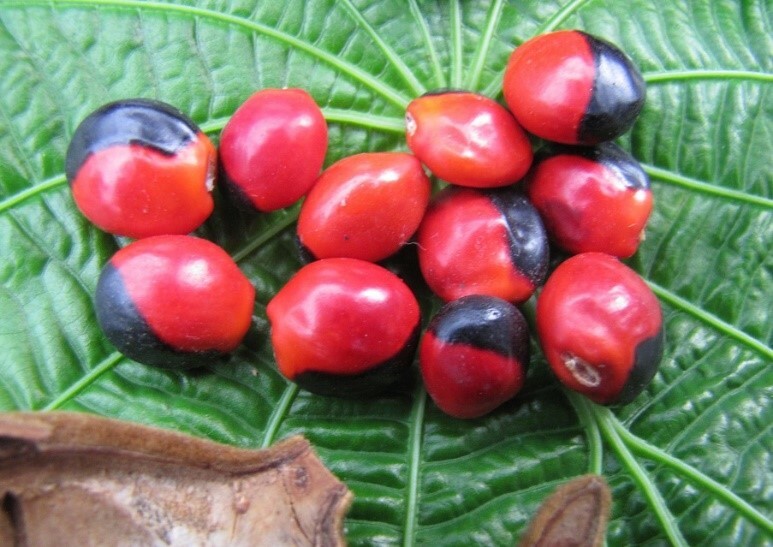 The reptilian fruit of Caraná – Mauritia carana. There are palms from every continent except Europe, and even more from islands, especially in the pacific and Indian oceans. The family as a whole not only tells us of the adventures of adaptation to different geographical conditions the evolutionary process has taken it but also reveals volumes about the changes our planet has taken during this time. 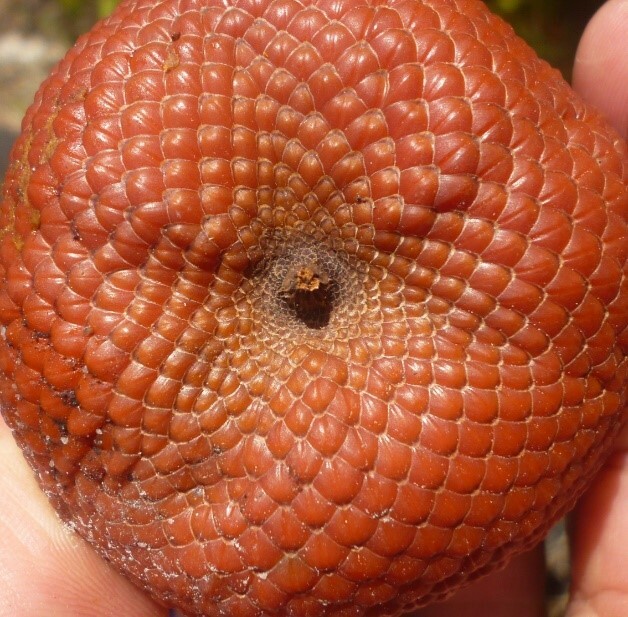 There is a curious species of native palm with fan-shaped leaves and fruit with skin resembling snake scales. There are several more species in the Amazon region. They seem to have no relatives. But exploring in Africa and Asia students discover different kinds of feather-leafed palms with almost the same scaly fruit. Another genus of palms that live in the cool climes of the Andes is closely related to species found in the Pacific, Australia and Madagascar, providing strong evidence that these continents were once joined as the geological evidence indicates. The plants themselves tell their story and exotic species add the missing chapters. This allows students to broaden their experience and their network of knowledge. The fractal pattern of knowing becomes clearer and easier. The integration of data, ideas and theories to synthesize ever deeper knowledge is emphasized in Selffinity as a way of getting closer to the truth than loose information. It is also necessary to really understand how knowledge is related, a multilayered, single body. This makes the knowledge more useful, easier to learn and more meaningful. Making connections and seeing beyond the observable becomes spontaneous in a diverse place like Selva Chi. The native tree arboretum is definitely the highlight of the botanical experience. It consists of 200 species of native trees and 58 of native palms in an area of about 10 hectares. It has functions that include: protecting endangered native species of plants, which also protects many other species; a seed bank for reafforestation; providing easily accessible research facilities with abundance of historical and integrated data; providing an intermediate contact point between humans and the local terrestrial ecosystems plus one marine ecosystem of Western Ecuador; providing educational facilities for the development of a more integrated and liberating education to that normally practice in Ecuador. The main circuit is a 2km long meandering track through 30m high regrowth forest (most trees are less than 20 years old). At some points it runs by the creek at 15m above sea level while at others it reaches the ridge top at 120m asl. There is a hectare of original forest and there are several patches that were harvested corn and papaya fields when the project commenced in 2006. The corn field, which now represents a rainforest community of 6000mm annual rainfall, took 7 years of nurturing before it gained the shade and moisture to be able to plant such delicate species. Now that area of about 0.75 of a hectare, harbours a community of 30 species of palms amongst their accompanying tree species, such as the endangered, endemic Chanul, slowly rising up through the softwoods that first established a canopy. There are 35 forest communities that contain they own composition of plant species in areas between 0.2-1.0Ha. Some of these communities in the drier areas have as few as 6 species of palms while five of the most stably moist areas have twenty species or more. However, in most of the arboretum, you might say it is difficult to see the palms for the trees. Most of the taller trees are local softwoods that, after forest destruction, grow quickly and recuperate the shady, moist habitat we know as rainforest. Most of the trees below 5m in height have been planted. These are trees from across Western Ecuador below 1000m altitude. The seeds of these trees, like the palms have to be collected during botanical excursions. Then they are germinated, raised in the nursery for a year or more and then planted in its appropriate community. This is just the beginning. They need years of maintenance to remove vines and shrubs that overgrow them, remove fallen branches and banana plants and stake up the plant again, and sometimes there are leaf-eaters to remove. Most species take one or two years establishing their roots before making significant above-ground growth. It may take another three to ten years until these reach a safe height of about 4m when they no longer need frequent attention. However there is always risk living in a forest. In mid-2018 a 6m tall Magnolia tree was flattened by a large falling tree-trunk. 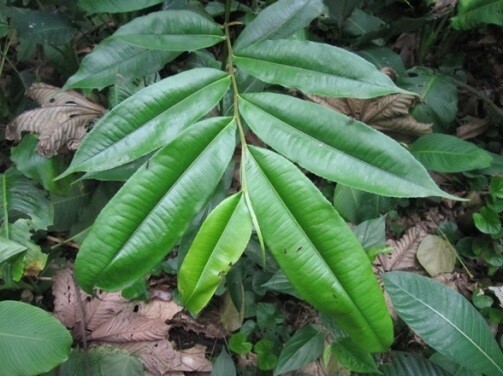 The tree appears to be recovering but will not attain the size and age hoped for, due to the base of the stem being shaved down to half-width. This is much more than a project, Selva Chi is a vocation. The management of this unique project requires scientific, technical and labor skills as well as very delicate and courageous intercultural human relations skills. This, added to climate change, makes providing such an educational experience for Ecuadorians a real challenge, but surely the most worthwhile investment for Ecuadorians and the whole planet. 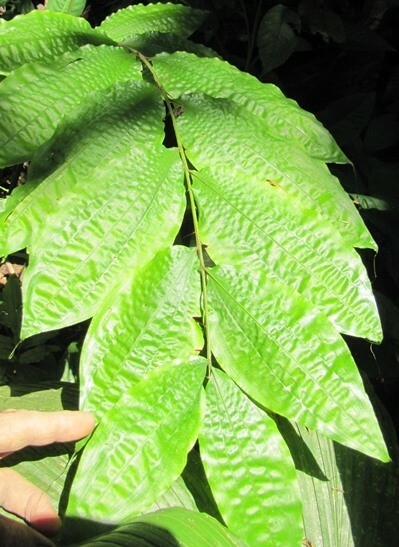 Unlike many projects this one is not designed with a termination date: it is a permanent challenge to all future generations to accelerate learning about our plant life, to save-guard more species and use Selva Chi to reforest Ecuador. It is particularly pertinent to the local people, most of whom actually see deforestation as the solution to their supposed poverty. 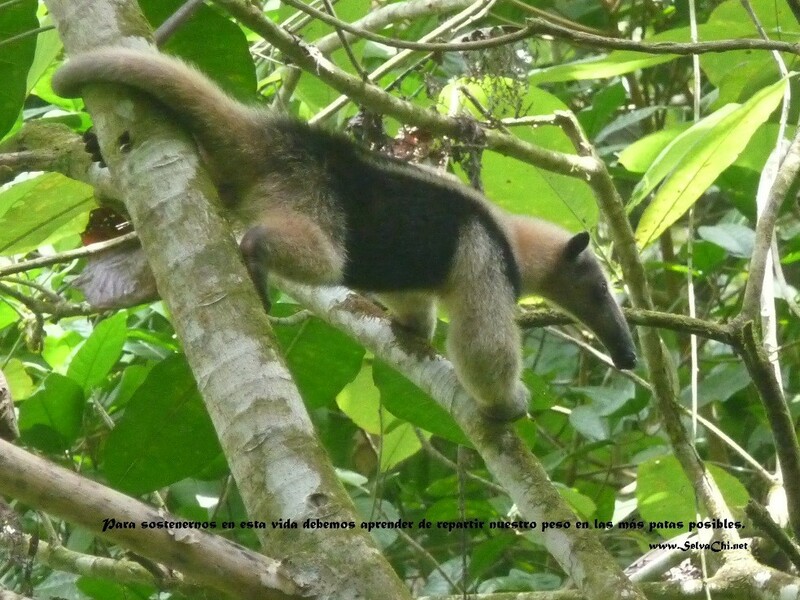 The Ant-eater – Tamandua mexicana var. punensis, is rarely about during the day in Selva Chi.